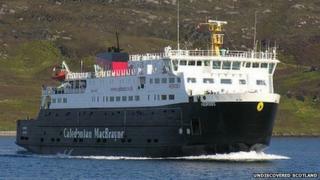 Image caption Tha dùil nach bi an MV Hebrides a' seòladh Diciadain nas motha. Chaidh na seòlaidhean eadar Loch nam Madadh agus Ùige a chur dheth airson a' chòrr den là ri linn trioblaidean tecnigeach. Thuirt Cal Mac gu bheil a h-uile coltas ann nach bi an MV Hebrides a' ruith Diciadain nas motha. Anns an eadar-ama, thathas a' stiuireadh charbadan chun na seirbhis eadar Ùige agus an Tairbeart, a th' air a frithealadh leis an MV Isle of Lewis an-dràsta. Thuirt Cal Mac cuideachd gun tèid dà sheòladh a bharrachd a chur air an t-slighe eadar Bearnaraigh agus an t-Òb airson dèiligeadh ri trafaig a bharrachd.